Many people think of cruises as luxurious, ultra-expensive getaways, but in truth, the best cruise deals are accessible to anyone. Prices can be slashed depending on many different factors, making cruises affordable and fun vacations for any budget. Prospective passengers should note, however, that depending on the cruise line, various hidden charges such as port fees, gratuities, shore excursions, and other amenities can rapidly increase a bill beyond the stated fare. For the best cruise deals, always consult an experienced travel agent and thoroughly investigate different options before booking a cruise vacation. Vacationers who revisit the same cruise line are often offered spectacular deals including free upgrades, discounted fares, exclusive parties, and other bonuses. While the specific sailings offering these discounts may be limited, they do provide some of the best discounts in the industry. To take advantage of these deals, passengers must sign up with a loyalty club after they have cruised with the line (memberships are generally free of charge), and the more frequently they cruise, the better the discounts. Cruise travelers can find generous deals based on their cabin choices. There is no class system on today's cruise ships, and passengers staying in lower cost cabins have access to the same gourmet menus, world class entertainment, and diverse ports of call that passengers with the most expensive cabins enjoy. Interior and obstructed-view cabins offer some of the best cruise deals, often hundreds of dollars cheaper for the same sailings as more luxurious cabins. Cruise ships gain more profit from onboard spending than from fares alone, and open spaces often have their prices slashed right before sailing to encourage passengers to join in with tremendous discounts. Cabin choices may be limited, but as with less expensive cabins, the amenities and other features of the ship are the same for every passenger no matter when they book or what cabin they choose. Cruise lines publish their itineraries up to 18 months before sailing, and passengers interested in specific ships or destinations can take advantage of early reservation deals. This also gives passengers the widest possible selection of cabins, and many cruise lines and travel agents will even match discounts after booking if cabin prices are reduced. Family reunions, weddings, and business trips can all take advantage of some of the best cruise deals because of the large number of passengers they bring to a ship. Blocks of cabins can often be reserved for better-than-published bargains, or groups will be offered additional amenities such as private parties, free photographs, and other bonuses that enhance the value of their vacation. Choosing to cruise during slower seasons is a great way to find some of the best cruise deals available. 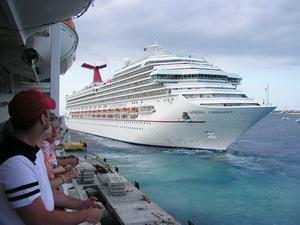 Holiday cruises are inevitably popular and more expensive, as are summer vacations and Spring Break months. Distant cruise regions (Alaska versus the Caribbean, for example) have different popular seasons, making off-season cruising available year-round in different locations. The difference between identical itineraries may be up to several hundred dollars per passenger depending on the season. Though not a stated fare discount, free upgrades can make any cruise a better deal than initially paid for. As incentives for reluctant passengers, cruise lines offer free cabin upgrades, in-cabin treats and souvenirs, free drinks, free airfare for transatlantic voyages, or even a limited selection of free shore excursions for selected sailings. Though the initial fare may be the same as for other voyages, those additional costs can lead to significant savings if passengers take advantage of the great deals. Families in particular can appreciate the deals associated with booking multiple passengers into the same cabin. Depending on the type of cabin and specific ship, 4-6 passengers may be able to be accommodated in the same cabin, often with two small sleeping areas to provide privacy. Luxury ships even have suite cabins that can accommodate 10 or more passengers; a great option for small groups or extended families. While the first and second passengers pay full fare rates, additional passengers often cruise for hundreds of dollars less than standard fares. As the cruising industry expands, new embarkation ports are being added and while they develop a steady flow of interested passengers, fares are often significantly lower than at more popular ports such as Miami or Los Angeles. While smaller ports generally offer fewer itinerary options and older ships, they are an affordable alternative for a relaxed vacation or for a novice cruisers looking to get their feet wet at a great price.